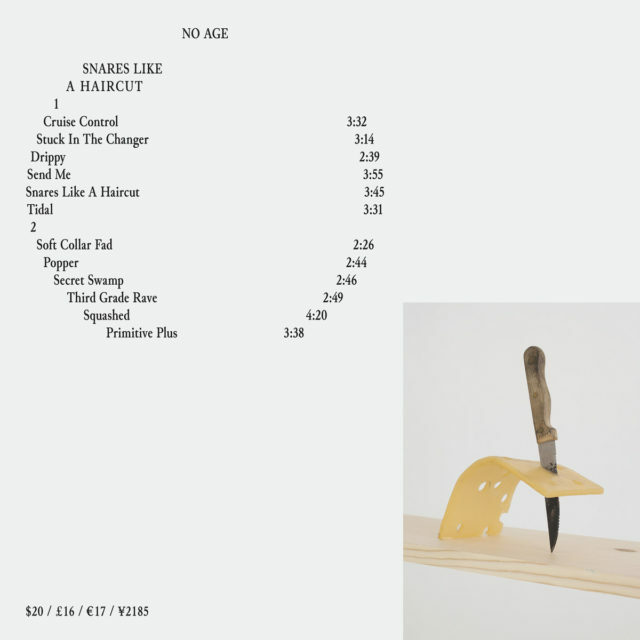 Snares Like A Haircut is the latest offering from manic noise producers No Age. The duo has spent the better part of a decade plotting and refining a cognitive paragon of punk escapism, unraveling polarities that represent a finessed vision of rock music. Drawing from these tendencies, No Age construct a sound that challenges whether dichotomies can coexist. Short answer: they can and with absolutely masterful results. Combining drilling distortion with crisp, ambient textures, the record is a sharp turn from the complex pop that permeated the band’s previous efforts. Rather, the album lands feet first toward cohesive and romping guitar rock. No Age have perfected their propensity for extremes, coalescing their intuition through remarkably imaginative sounds. Across these 12 sprawling tracks, Snares Like A Haircut tugs and pulls with leverage.